Zamanlararası bütçe kısıtı Kuramı 1980–2004 dönemi için Türkiye’nin kamu açıklarına uygulanmıştır. Bu çalışmanın amacı bütçe açıklarından doğan kamu borcunun Türkiye’nin cari politikasının sürdürülebilirliğini tehdit edip etmediğini ortaya koymaktır. Kişi başına ve GSMH'nın oranı olarak ifade edilen reel hükümet gelir ve harcamaları ile bütçe açığının çok büyük olup olmadığı test edilmiştir. Elde edilen sonuçlar bütçe açığının sürdürülebilir olduğunu ortaya koymaktadır. Ahmed, S. and J. H. Rogers (1995) “Government Budget Deficits and Trade Deficits Are Present Value Constraints Satisfied in Long-Term Data?,” Journal of Monetary Economics, vol.36, no.2, pp. 351-374. Baglioni, A. and Cherubini U. (1993) “Intertemporal Budget Constraints and Public Debt Sustainability: The case of Italy”, Applied Econometrics, vol.25, pp. 275-283. Bohn, H. (1998) “The Behavior of U.S. Deficits Public Debt and Deficits” Quarterly Journal of Economics, vol.113, pp. 949-963. Caparole, M. G. (1995) “Bubble Finance and Debt Sustainability: a Test of the Government’s Intertemporal Budget Constraint”, Applied Econometrics, vol.27, pp. 1135-1143. Enders, W. (1995) Applied Econometrics, New York: John and Wiley Sons Inc. Gujarati, D. N. (1995) Basic Econometrics. New York: McGraw-Hill Inc., International Third Edition. Hakkio, C. S. and M. Rush. (1991) “Is the Budget Deficit ‘Too Large?’” Economic Inquiry, vol.29, no.3, pp. 429-445. Hamilton, J. D. and M. A. Flavin. (1986) “On The Limitations of Government Borrowing: A Framework for Empirical Testing”. The American Economic Review, vol.76, no.4, pp.808-819. Özmen, E. and Ç. İ. Koğar (1998) “Sustainability of Budget Deficits in Turkey with Structural Shift” METU studies in Development, vol.25, no.1, pp.107- 127. Quintos, Carmela E. (1995) “Sustainability of Deficit Process with Structural Shifts,” Journal of Business & Economic Statistics, vol.13, no.4, pp. 409- 417. Sakal, M. (2002) “Türkiye’de Kamu Açıkları ve Borçlanmanın Sürdürülebilirliği Sorunu: 1988-2000 Dönem Analizi” D.E.Ü.İ.İ.B.F. 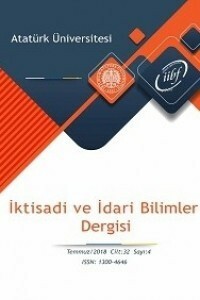 Dergisi, Cilt 17, Sayı 1, ss.35-60. Tanner, E. and Liu P. (1994) “The Budget Deficit ‘Too Large’ Some Further Evidence,” Economic Inquiry, vol.32, no.3, pp. 511-518. Trehan, B. and C. E. Walsh (1991) “Testing Intertemporal Budget Constraints: Theory and Applications to U.S. Federal Budget and Current Account Deficits,” Journal of Money, Credit and Banking vol.23, no.2, pp. 206- 223. Wickens, M.R. and Uctum M. (1993) “The Sustainability of Current Account Deficits: A Test Of The U.S. Intertemporal Budget Constraint.” Journal of Economic Dynamic and Control, vol.17, no.3, pp. 423-441. Wilcox, D. W. (1989) “The Sustainability of Government Deficits: Implications of the Present-Value Borrowing Constraint”. Journal of Money, Credit and Banking, vol.21, no.3, pp. 291-306. ISNAD Azgün, Sabri , Taşdemir, Murat . "BÜTÇE AÇIKLARININ SÜRDÜRÜLEBİLİRLİĞİ: TÜRKİYE’NİN ZAMANLARARASI BORÇLANMA KISITININ TESTİ (1980-2004)". Atatürk Üniversitesi İktisadi ve İdari Bilimler Dergisi 20 / 2 (November 2010): 35-45.